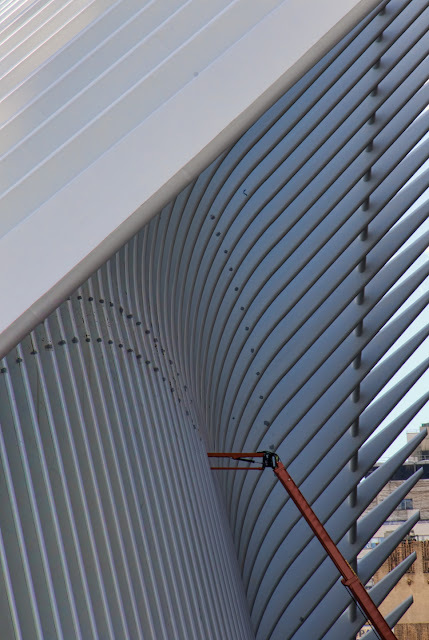 This is the new World Trade Center Transportation Hub, designed by Santiago Calatrava, scheduled to open in December. It's stunningly beautiful, and I can't wait to see the inside. In the meantime, I love that orange crane poking into the side. I want to say that it looks like a baby dinosaur trying to nurse, except of course that dinosaurs didn't nurse and (probably) weren't orange, and seldom frequent Lower Manhattan these days.